Get Rid of Bush & What do you Have in Clark? His job is to guarantee Bush Junior gets reelected. His job is to see that no viable Democratic candidate survives the primaries. His job, should he miraculously get elected over Bush, is to then run, execute, implement the American-led Empire precisely as George Bush Junior would have done. 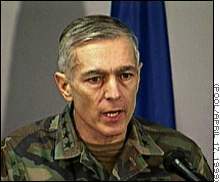 Not long after general Wesley Clark declared his candidacy for President in 2004, a number of stories hit the press which should give the liberal-left Democrats pause in their rather odd support for the general. One must realize that their field of candidates is weak in the extreme. Mr. Bush and Mr. Cheney have almost single-handedly raised almost twice the money for the race, 0 million, than all the Democrats combined, Bush is a war-president who has the corporate media in one pocket for the most part and the remainder of much of the monopoly corporate world in his other. But for the Democrats to swarm to the Clark hive and act the part of raw instinctual, insect-like, partisanship, in the vain hope the general can beat Bush is sheer idiocy! Bees swarm right before they die. But the entire bill of goods, as was put in the article above, was to protect the homeland from terrorism, not protect the government from the homeland -- you and I. There is no reason why new powers granted law enforcement cannot be kept within the specific set of guidelines, the legal parameters, set out in the law’s intent (in legalese “intent” of the law is everything) to get the job done, and still not expand on the use of their new powers to areas never “intended.” Indeed, “intent” is everything in jurisprudence. Every government, since the dawn of time, lies (and only “men” tell lies; institutions cannot speak as Numb Chomsky would have it) and will use all means necessary to protect itself from its citizens; the undesirable citizens, minorities and the dissenters are first to be declared criminals and are always and everywhere simply the first to be persecuted, prosecuted and placed under surveillance under the new regime’s expanded powers. (Every new law, every expanded jurisdiction of existing laws, creates a new class of criminals where none existed before -- or existed as simple misdemeanor cases and now advanced to felony crimes and upon conviction a greater level of punishment). The idea being the punishment should fit the crime is judiciously thrown out the jurisprudential window. It is now being reported that “a new Justice Department report, given to members of Congress this month, also cites more than a dozen cases that are not directly related to terrorism in which federal authorities have used their expanded power to investigate individuals, initiate wiretaps and other surveillance, or seize millions in tainted assets. As though the law, law enforcement and the criminal justice system never errs? Of course Justice Department officials have already made their own simpleton’s retort to the story cited above saying (predictably): “....officials said the cases cited in the report represent only a small sampling of the many hundreds of non-terrorism cases pursued under the law.” Number of cases is of course not the point at all, but that their powers are being expanded in areas without the rule of law’s intent being applied. In other words, they are, in doing so, breaking the law’s intent, which is to say, breaking the law. There are others reported as well: “[And] officials said they had used their expanded authority to track private Internet communications in order to investigate a major drug distributor, a four-time killer, an identity thief and a fugitive who fled on the eve of trial by using a fake passport....In one case, an e-mail provider disclosed information that allowed federal authorities to apprehend two suspects who had threatened to kill executives at a foreign corporation unless they were paid a hefty ransom, officials said. Previously, they said, gray areas in the law made it difficult to get such global Internet and computer data.” But again, the law was never intended to be used for anything but terrorist cases. The immediate “explanation” above, while certainly useful in the Department’s making its case, is again, not the point! As I have explained to my personal business client base, well over half of Patriot Act I was, and is, directly applicable to only financial areas, for use in other areas not “intended.” (This is purportedly to catch financial crimes of terrorist’s and their funding sources, and thus seize bank accounts; this was the foil for expanding these powers) As the Times reported “The law passed by Congress just five weeks after the terror attacks of Sept. 11, 2001, has proved a particularly powerful tool in pursuing financial crimes.” Officials with the Bureau of Immigration and Customs Enforcement have seen a sharp spike in investigations as a result of their expanded powers, officials said in interviews.” (Ibid.) One area of supreme importance to everyone without a totalitarian streak in their heart like Hannity and O’Reilly, is what every government begins to do the more it turns into Empire or any other form of totalitarian governance: that is, restrain capital flight. And Patriot Act I & II has been predictably used for exactly this. It is the view of all intelligent citizens and this office (I feign believe I have some Grey matter somewhat wrinkled, although I may be very wrong on the point.) that capital flight is the number one threat to Empire; its citizens, seeing the erosion of liberties, loss of rights, random persecutions and trumped-up charges against a growing number of fellow citizens, seek to leave the country with whatever they can get out with. When the inevitable draft of the youth takes effect, which would go down with little resistance if it were implemented by a former retired (and retired for good reason) four star general posing as a Democrat in the White House, the youth may, as well as their wealthier peers, want to leave the country as well. And the wealthier are already speaking of this in private: move to Mexico, France or Germany where their rights would still matter. Capital flight is always the first thing to begin to happen when a nation begins on the slippery slope of tyranny. People try to leave with as much cash and coin, gold and silver in greater numbers; tax avoidance is inherent in the process. The growing underground economy another. Remember the federal deficits. A guide to a Justice Department employee seminar last year on financial crimes, for instance, said: “We all know that the USA Patriot Act provided weapons for the war on terrorism. But do you know how it affects the war on crime as well?” One way was to target any and all businesses who utilize credit card transactions as part of their business and become open to regulatory invasion by the private banking system issuing the credit card processing procedures. Where the regulations were but a two page document for the retailer to follow just last year in using credit card transaction’s electronic funds transfer at the point of sale (EFT/POS) with their customers, Patriot Act I gave the banking industry free reign in regulatory capacity over retailers of all sizes. The paperwork has grown to 51 pages and the banks are now allowed to “audit” any retailer, at any time, in a full financial “field” audit using an outside contractor (auditing firms like one of the Big Eight). The retailer, no matter how small, how little business is done with credit cards, must pay for the audit no matter how much is billed to them by, say, one of the Big Eight. This applies to all retailers regardless of size. The public not self-employed, and many small business owners will never hear of these changes, nor any criminal charges brought against smaller companies’ owners. That is just not news to the news media. This is an outrageous invasion of the [free] enterprise’s financial privacy by the private monopoly banking system which set up the Internal Revenue System (IRS) in the first place through the Federal Reserve System to collect taxes from the citizenry. Do recall the real reason for the founding of the IRS the same year as the Federal Reserve System itself, circa 1913? To collect taxes, yes, but it was set up because it is the Federal Reserve System’s extended private, for-profit, banking system which owns the federal reserve banks and has exclusive rights to loan the money to the federal government to monetize its debt...the deficit that is to say. Therefore the IRS is the Federal Reserves’ tow-truck for the banks under “the guise” of collecting those taxes you volunteer to pay. A lot of things in government are done “under the guise” to achieve other objectives, like running Wesley Clark “under the guise” of being a Democrat who is critical of Bush; his criticism a “guise” as well, which we will all only discover should he win, which is not his intent, his intent is to lose. This will all come out in the wash, as they say. But should he win Clark would inherit the regime’s Patriot Act I & II and Homeland Security. A former four star general will truly then be our Commander and Chief. With powers granted him under the guise of the new laws in areas unrelated to terrorism. Elliot Mincberg, legal director for People for the American Way, a liberal group that has been critical of Mr. Ashcroft, said the Justice Department’s public assertions had struck him as misleading and perhaps dishonest. “What the Justice Department has really done,” he said, “is to get things put into the law that have been on prosecutors’ wish lists for years. They’ve used terrorism as a guise to expand law enforcement powers in areas that are totally unrelated to terrorism.” (Ibid.) That is precisely the point and the truth of it. And the Democrats want these powers in the hands of a former military man? A study in January by the General Accounting Office, the investigative arm of Congress, concluded that while the number of terrorism investigations at the Justice Department soared after the Sept. 11 attacks, 75 percent of the convictions that the department classified as “international terrorism” were wrongly labeled. Many dealt with more common crimes like document forgery. The terrorism law has already drawn sharp opposition from those who believe it gives the government too much power to intrude on people’s privacy in pursuit of terrorists. Anthony Romero, executive director of the American Civil Liberties Union, said, “Once the American public understands that many of the powers granted to the federal government apply to much more than just terrorism, I think the opposition will gain momentum.” Senator Patrick J. Leahy of Vermont, the ranking Democrat on the Judiciary Committee said members of Congress expected some of the new powers granted to law enforcement to be used for non-terrorism investigations. But he said the Justice Department’s secrecy and lack of cooperation in implementing the legislation have made him question whether “the government is taking shortcuts around the criminal laws” by invoking intelligence powers - with differing standards of evidence - to conduct surveillance operations and demand access to records. “We did not intend for the government to shed the traditional tools of criminal investigation, such as grand jury subpoenas governed by well-established precedent and wiretaps strictly monitored” by federal judges, he said. No sir, this office disagrees: “garden variety criminals” are not terrorists planning to use weapons of mass destruction. And “garden variety criminals” should be accorded more protections under the law as the law has always intended. They are, let us try to recall, “innocent until ‘proven’ guilty.” Throwing out probable cause, Writ of Habeas Corpus, Posse Comitatus Act of 1878, allowing the CIA and NSA to operate domestically hand-in-hand with regular law enforcement is an outrageous escalation against the citizens of a free republic based upon democratic principles. That is, “if” we are still a free republic? And “that” is still based upon “valid” democratic principles? None of which may be true any longer. Of course the subjects of empire have no such liberties or rights, as they are subject to the subjective rule of their rulers. And now comes the point to all this written revelry. You Democrats want George Bush Junior out, who has pressed forward these vile authorizations under the law, with a duly compliant Congress, both D’s and R’s, having uttered nary-a-peep, and would see all this centralized power handed over to a died-in-the-wool life-long voting Republican Four Star General who has sung the praises of the two successive Bush Administrations over the years? Are Democrats this stupid? Are the people? well, yes “the people are.” But will the Democratic Party elite not see this Trojan Horse afoot, shod with shoddy trappings, this stalking horse for George W. Bush Junior? His job is to guarantee Bush Junior gets reelected. Not himself. His job is to see that no viable Democratic candidate survives the primaries. Only himself! His job, should he miraculously get elected over Bush, which is not in the plan, but plans go awry, is to then run, execute, implement the American-led Empire precisely and pristinely as George Bush Junior would have done. Should the General get elected THE GENERAL will then do an “about-face,” in military jargon, ... guaranteed. He knows how to take orders. FUBAR! We’ll see how he really feels about dissent if what I have written here becomes common knowledge “out there.” For what this general represents is nothing so much as high treason. And thus Patriot Act I “ought to apply to him” as well as you and I. But that is highly unlikely under Empire’s imperial rule. Original: Get Rid of Bush & What do you Have in Clark?